The Chief Priests and the Ancients of the people, are met today, in one of the rooms adjoining the Temple, for the purpose of deliberating on the best means of putting Jesus to death. Several plans are discussed. Would it be prudent to lay hands upon him at this season of the Feast of the Pasch, when the City is filled with strangers, who have received a favourable impression of Jesus from the solemn ovation given to him three days back? Then, too, are there not a great number of the inhabitants of Jerusalem, who took part in that triumph, and whose enthusiastic admiration of Jesus might excite them to rise up in his defense? These considerations persuade them not to have recourse to any violent measure, at least for the present, as a sedition among the people might be the consequence, and its promoters, even were they to escape being ill-treated by the people, would be brought before the tribunal of the Roman Governor, Pontius Pilate. They, therefore, come to the resolution of letting the Feast pass quietly over, before apprehending Jesus. But these blood-thirsty men are making all these calculations as though they were the masters. They are, if they will, shrewd assassins, who put off their murder to a more convenient day: but the Divine decrees, – which, from all eternity, have prepared a Sacrifice for the world’s salvation, – have fixed this very year’s Pasch as the day of the Sacrifice, and, tomorrow evening, the holy City will re-echo with the trumpets, which proclaim the opening of the Feast. The figurative Lamb is now to make way for the true one; the Pasch of this year will substitute the reality for the type; and Jesus’ Blood, shed by the hands of the wicked priests, is soon to flow simultaneously with that of victims, which have only been hitherto acceptable to God, because they prefigured the Sacrifice of Calvary. The Jewish priesthood is about to be its own executioner, by immolating Him, whose Blood is to abrogate the Ancient Alliance, and perpetuate the New one. But how are Jesus’ enemies to get possession of their divine Victim, so as to avoid a disturbance in the City? There is only one plan that could succeed, and they have not thought of it: it is treachery. 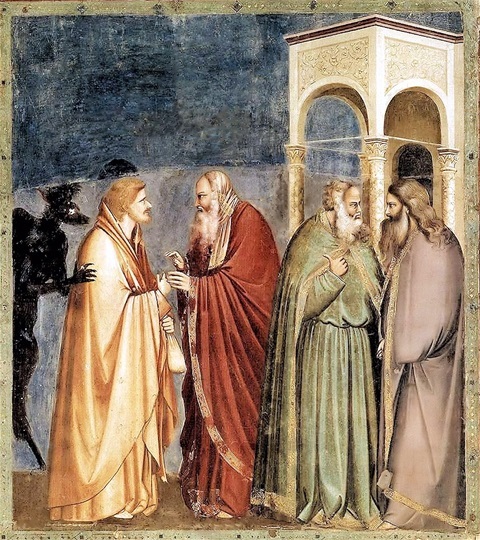 Just at the close of their deliberations, they are told that one of Jesus’ Disciples seeks admission. They admit him, and he says to them: What will you give me, and I will deliver him unto you? 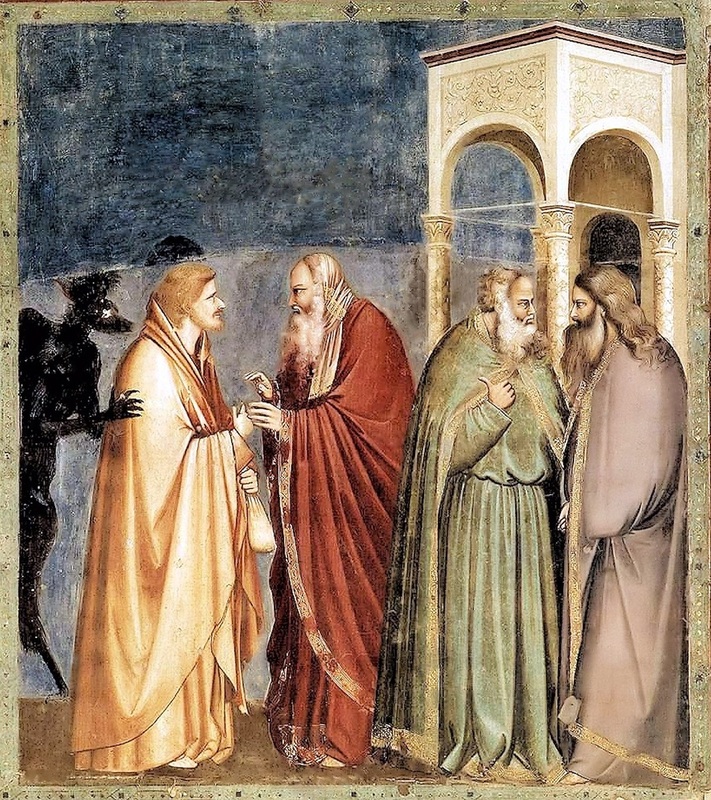 (St. Matt, xxvi, 15) They are delighted at this proposition: and yet, how is it, that they, doctors of the law, forget that this infamous bargain between themselves and Judas has all been foretold by David, in the 108th Psalm? They know the Scriptures from the beginning to end; – how comes it, that they forget the words of the Prophet, who even mentions the sum of thirty pieces of silver (Zach, xi. 12). Judas asks them what they will give him; and they give him thirty pieces of silver! All is arranged: tomorrow, Jesus will be in Jerusalem, eating the Pasch with his Disciples. In the evening, he will go, as usual, to the Garden on Mount Olivet. But how shall they, who are sent to seize him, be able to distinguish him from his Disciples? Judas will lead the way; he will show them which is Jesus, by going up to him and kissing him! Such is the impious scheme devised on this day, within the precincts of the Temple of Jerusalem. To testify her detestation at it, and to make atonement to the Son of God for the outrage thus offered him, the Holy Church, from the earliest ages, consecrated the Wednesday of every week to penance. In our own times, the Fast of Lent begins on a Wednesday; and when the Church ordained that we should commence each of the four Seasons of the year with Fasting (Ember days), Wednesday was chosen to be one of the three days thus consecrated to bodily mortification. Let us compassionate with our Holy Mother Church, whose Heart is filled with poignant grief at the foresight of the Sacrifice, which is preparing. V. Let us kneel down. Grant, we beseech thee, O Almighty God, that we, who continually are punished for our excesses, may be delivered by the Passion of thy Only Begotten Son. Who liveth, and reigneth with Thee and the Holy Ghost, One God for ever. Amen. Lesson from Isaias the Prophet. Ch. lxii. & lxiii. Thus saith the Lord God: Tell the daughter of Sion: Behold thy Saviour cometh. Who is this that cometh from Edom, with dyed garments from Bosra, this beautiful one in his robe, walking in the greatness of his strength? I, that speak justice, and am a defender to save. Why then is thy apparel red, and thy garments like them that tread in the wine-press? I have trodden the wine-press alone, and of the Gentiles there is not a man with me; I have trampled on them in my indignation, and have trodden them down in my wrath, and their blood is sprinkled upon my garments, and I stained all my apparel. For the day of vengeance is in my heart, the year of my redemption is come. I looked about, and there was none to help; I sought, and there was none to give aid; and my own arm hath saved me, and my indignation itself hath helped me. And I have trodden down the people in my wrath, and made them drunk in my indignation, and have brought down their strength to the earth. I will remember the tender mercies of the Lord, the praise of the Lord, for all the things that the Lord hath bestowed on us. How terrible is this our Defender, who tramples his enemies beneath his feet, as they tread in the wine-press; so that their blood is sprinkled upon his garments! But is not this the fittest time for us to proclaim his power, now that he is being treated with ignominy, and sold to his enemies by one of his Disciples? These humiliations will soon pass away; he will rise in glory, and his might will be shown by the chastisements, wherewith he will crush them that now persecute him. Jerusalem will stone them that shall preach in his name; she will be a cruel step-mother to those Israelites, who, docile to the teaching of the Prophets, have recognized Jesus as the promised Messias. The Synagogue will seek to stifle the Church in her infancy; but no sooner shall the Church, shaking the dust from her feet, turn from Jerusalem to the Gentiles, than the vengeance of Christ will fall on the City, which bought, betrayed, and crucified him. Her citizens will have to pay dearly for these crimes. We learn from the Jewish historian, Josephus (who was an eye-witness to the siege,) that the fire which was raging in one of the streets, was quenched by the torrents of their blood. Thus were fulfilled the threats pronounced by our Lord against this faithless City, as he sat on Mount Olivet, the day after his triumphant Entry. And yet, the destruction of Jerusalem was but a faint image of the terrible destruction which is to befall the world at the last day. Jesus, who us now despised and insulted by sinners, will then appear on the clouds of heaven, and reparation will be made for all these outrages. Now he suffers himself to be betrayed, scoffed at, spit upon; but, when the day of vengeance is come, happy they that have served him, and have compassionated with him in his humiliations and sufferings! Wo to them, that have treated him with contempt! Wo to them, who not content with their own refusing to bear his yoke, have led others to rebel against him! For he is King; he came into this world that he might reign over it; and they that despise his Mercy, shall not escape his Justice. O God, who wouldst have thy Son suffer on the Cross, to deliver us from the power of the enemy; grant that we thy servants, may obtain the grace of his resurrection. Through the same Christ our Lord. Amen. Lesson from Isaias the Prophet. Ch. liii. In those days: Isaias said: Who hath believed our report? and to whom is the arm of the Lord revealed? And he shall grow up as a tender plant before him, and as a root out of a thirsty ground. There is no beauty in him, nor comeliness. And we have seen him, and there was no sightlines that we should be desirous of him; despised, and the most abject of men, a man of sorrows, and acquainted with infirmity. And his look was as it were hidden and despised; whereupon we esteemed him not. Surely he hath borne our infirmities, and carried our sorrows. And we have thought him as it were a leper, and as one struck by God and afflicted. But he was wounded for our iniquities, he was bruised for our sins; the chastisement of our peace was upon him, and by his bruises we are healed. All we like sheep have gone astray, every one hath turned aside into his own way; and the Lord hath laid upon him the iniquity of us all. He was offered because it was his own will, and he opened not his mouth. He shall be led as a sheep to the slaughter, and shall be dumb as a lamb before his shearer; and he shall not open his mouth. He was taken away from distress, and from judgment. Who shall declare his generation? because he is cut off out of the land of the living. For the wickedness of my people have I struck him. And he shall give the ungodly for his burial, and the rich for his death; because he hath done no iniquity, neither was there deceit in his mouth. And the Lord was pleased to bruise him in infirmity. If he shall lay down his life for sin, he shall see a longlived seed, and the will of the Lord shall be prosperous in his hand. Because his soul hath labored, he shall see and be filled; by his knowledge shall this my just servant justify many, and he shall bear their iniquities. Therefore will I distribute to him very many, and he shall divide the spoils of the strong, because he hath delivered his soul unto death, and was reputed with the wicked; and he hath borne the sins of many, and hath prayed for the transgressors. Again it is Isaias that instructs us, not indeed upon the triumph which our Emmanuel is to win over his enemies, but upon the sufferings of the Man of Sorrows. So explicit is his description of our Lord’s Passion, that the holy Fathers have called him the fifth Evangelist. What could be more sublimely plaintive than the language here used by the son of Amos? And we, after hearing the Old and New Testament upon the sufferings which Jesus went through for our sons,– how shall we sufficiently love this dear Redeemer, who bore our infirmities and carried our Sorrows, so as to look as a leper, and as one struck by God and afflicted? We are healed by his bruises! O heavenly Physician, that takes upon himself the sufferings of them he comes to cure! But not only was he bruised for our sins; he was also slaughtered as a lamb: and this not merely as a Victim submitting to the inflexible justice of his Father who hath laid upon him the iniquity of us all, but, (as the Prophet here assures us,) because it was his own will. His love for us, as well as his submission to his Father, led him to the great Sacrifice. Observe, too, how he refuses to defend himself before Pilate, who could so easily deliver him from his enemies: He shall be dumb as a lamb before his shearers, and he shall not open his mouth. Let us love and adore this divine Silence, which works our Salvation. Let us not pass over an iota of the devotedness which Jesus shows us,– a devotedness which never could have existed, save in the Heart of a God. On! how much he has loved us,– his children, the purchase of his Blood, his Seed, as the Prophet here calls us. O Holy Church! thou long-loved Seed of Jesus, that laid down his life!– thou art dear to him, for he bought thee at a great price. Faithful Souls! give him love for love. Sinners! be converted to this your Saviour; his Blood will restore you to life, for if we have all gone astray like sheep, remember what is added: The Lord hath laid upon him the iniquity of us all. There is no sinner, however great may be his crimes; there is no heretic, or infidel, who has not his share in this Precious Blood, whose infinite merit is such, that it could redeem a million worlds, more guilty even than our own. Today, the Church gives us the history of the Passion according to St. Luke. This Evangelist mentions several details not given by Saints Matthew and Mark, which will assist us to a fuller understanding of the divine mystery of the Sufferings and Sacrifice of the Man-God. Click here, to read the Passion of Our Lord Jesus Christ according to the Gospel of St. Luke. Taken from: The Liturgical Year - Passiontide and Holy Week, Dublin, Edition 1870. 1. The Passiontide and Holy Week. 2. The Holy Season of Lent. 3. Laws of Fasting and Abstinence. 5. The Seven Penitential Psalms. 6. Devotion to our Lord’s Passion. 7. Devotion to our Lady’s Sorrows. Glory be to thy patience, O Lord!